The fifth day of the trip was the first day of work. 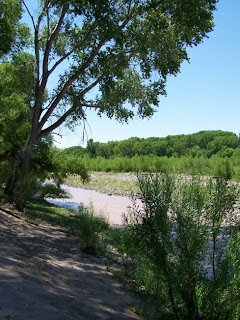 We were involved in a project looking at the biodiversity along the Gila River. This research will be used to help assess the potential impacts of diverting water from the river during periods of heavy flooding. There were three groups involved in this work, our group was assesed the vegetation, other groups took data on birds and herps (reptiles and amphibians). In all, we had about 48 sites along the river that needed to be sampled and each site we sampled three circular plots (18 m diameter). This was the second year of the study. For the first week I was lucky enough to work with Hilary, a terrific botanist and a wonderful field partner. We go along wonderfully, which makes the work go more smoothly. 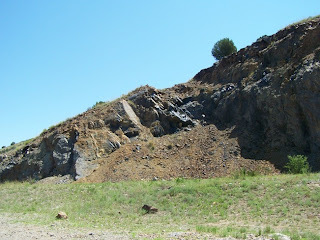 Basically, each day we located a site along the river using maps and a GPS unit. Once at the site, we had to locate the plots by finding the rock cairn marking the center of the plot (which is not as easy as it sounds). We then flagged the perimeter of the circulat plot using a meter tape. This was often the most tedious and difficult part of the work, as the sometimes thick vegetation preventing us from simply walking a circle. Instead, there was a lot of walking from the center of the plot to the edge over and over again. However, sometimes we would get lucky and the plot would be a on a gravel/cobble/sand bar with little to no woody vegetation. After the plot was laid out, then the fun began. We would walk around the entire plot and record all of the plant species we saw. If we did not know what a plant was, then we would collect it to be identified later that night back in the lab. Once we ID'd all of the plants, we had to determine for each species what percentage of the plot that plant covered. 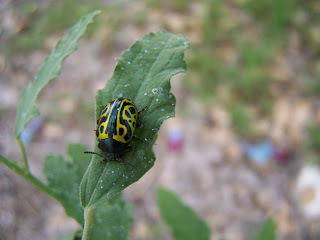 The first day went slowly, as there were many, many plants that I had to learn. 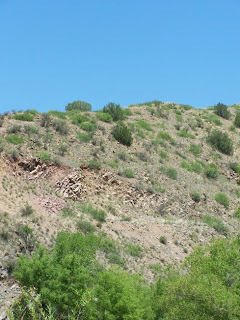 The landscape surrounding our site was gorgeous, mostly juniper-pinyon pine scrubland. 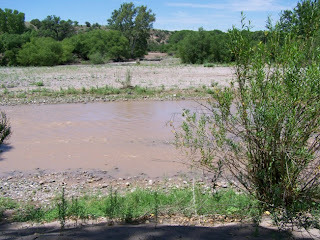 Here is the Gila River at our first site. I am told that the river is usually crystal clear, but fire upstream in the last year combined with recent flooding resulted in water the color of chocolate milk. Which doesn't bother me, I grew up in Oklahoma and am used to swimming in muddy lakes. One very pleasant surprise was the coolness of the water. 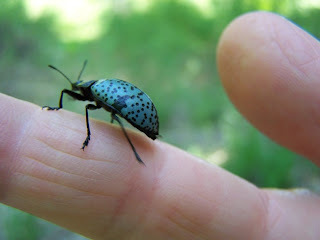 Of note on the first day were two amazing beetles we found.